Here’s the shiny envelope that holds the info cards and invoice for the box. I got a few different promo cards for different businesses in this box. The first one is for Nurx, a birth control company. The next one is an ad for Veestro, which is a healthy frozen meal subscription service. The first item in this box is this white semi-sheer tank, which has a wide open back to keep it breezy. It’s made from a super-stretchy polyester spandex blend that’s comfy, but just a tiny bit shapeless for my tastes. Still, it’ll be handy to have especially towards spring, when I need something to throw on over a sweaty yoga-class bra top before walking down the street for a smoothie. These leggings have the strangest (coolest?) texture! I can’t decide whether or not I like it or not, to be honest. Unfolding them was more like peeling them apart—the glossy finish grips against itself kind of like cling wrap. The polyester-spandex-blend fabric is on the thinner side, with a super close fit that doesn’t hide much. The shininess doesn’t help with that hiding things problem either! But I appreciate the wide high waist, and it’s hard for me to ignore a pair of solid black leggings. They’re just so versatile! The last wearable item I got was this gray cardigan. I love the color, and the polyester-rayon-spandex fabric is comfy and stretchy. It’s kind of like what you’d expect from a lightweight hoodie. The cut of the cardigan fits my body well, too. I’m always cold, so cardis and jackets like this are always nice to have around. I feel like I could wear this to work over a nice top if I wanted. It’s pretty polished for a workout look. PS, I was able to find this in black, but not in dove gray, hence the estimated value above. I love the color scheme of this jump rope. It’s sort of a coppery color with dove-gray accents. Sometimes I’ll take a jump rope along with me on a walk in the nearby park and try to do 20 turns or so every so often, just to up the impact of my walk. I’ll have to hang this one up on a door for awhile to let the plastic relax (there are some stubborn bends in it), but then I’ll have to add it to my routine! Ab wheels look so innocent, but for someone without a ton of core strength, wow are they ever tough! The idea is that you get into an adjusted push-up position, where you’re essentially in a plank, but with knees down, but hold the handles on the wheel rather than having your hands on the floor beneath your shoulders. The exercise sounds simple—you simply push the wheel out in front of you, holding your core tight, then use your core to pull your body back to the original position. But hoooo baby, does this ever do a number on your body! The narrowness of the wheel also adds a balance challenge to your typical plank. Nice! 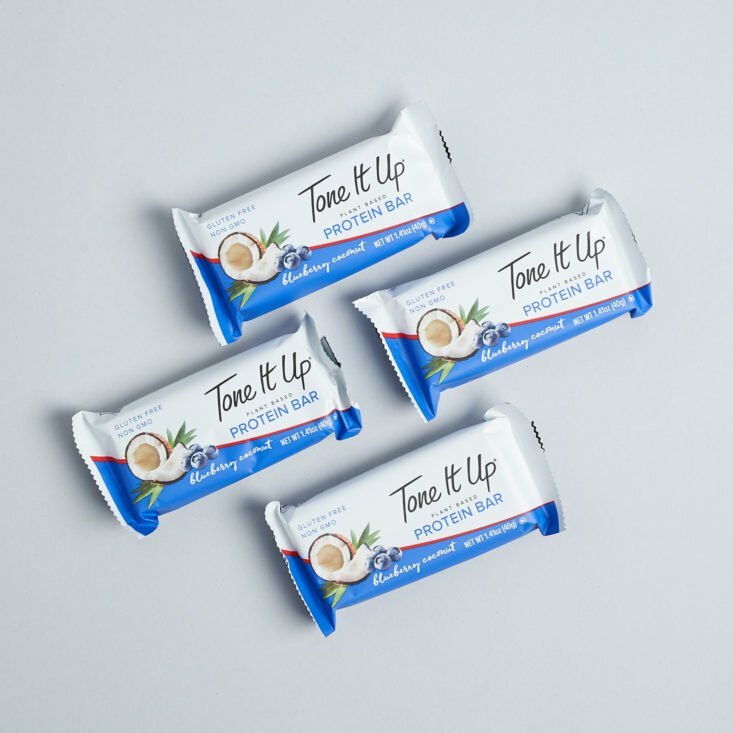 These crunchy bars have a bit of that protein powdery taste, but not anywhere close to the mealy flavor that turns me off of so many protein bars. The blueberry coconut flavor is on the milder side, but that’s a symptom of the good fact that these are relatively low in sugar. I used this box of bars as my afternoon work snack resource for a week and enjoyed how they hit the spot without being too overly sweet or salty or too filling. Verdict: While I’m still determining whether or not I like the finish on those leggings, I do appreciate the quality and convenience of this subscription. The fact that you get a whole outfit rather than just one piece or type of piece. Everything coordinates, too, which means I can wear them together or mix and match the looks with things I already have. The workout accessories are cool, too, especially if you’re trying to improve your at-home fitness game. This months legging were not my favorite. I like the set so that is why I chose it. The leggings were definitely different than any other pair I’ve owned, but once I tried them on, I totally felt like Olivia Newton John in Grease! I’m going to have to figure out a way/place to go where I can wear these out as pants…..
How come every fitness review I read only has leggings for pants? I never wear leggings because it’s not a good look on me. Really? So what do you wear? I can’t speak for AMH, but I wear sweat pants at the gym. I like those better also. I can wear leggings but it’s most of the year it’s too hot where I live. So I like looser pants that have a bit of air flow potential. You are an outlier, most women wear workout leggings as witnessed in my gym. In the summer I’ll occasionally see shorts. Ellie did have a lounge collection, October 2018 that included charcoal joggers which I loved. The charcoal joggers are my favorite purchase from Ellie so far. SO COMFORTABLE!!!! I love “athleisure” clothing. It’s the best trend ever, imo. I truly think there is something for everyone, you just have to keep looking. Personally, I’ve had great luck with the leggings from Fabletics. I think you should give leggings a shot, unless you’re always doing cardio or something. They aren’t flattering on me either but I need something fitted to make sure I’m using proper form. For me athletic wear is about utility and not looks, except when it comes to patterns and stuff. But reviews for looser workout wear would be a bad thing! Ha sorry *wouldn’t* be a bad thing. I used to hate leggings. Now I live in them. Some yoga and aerial aerobics classes actually require leggings. But I do agree more choices should be provided. It’s hard to find other options. I wonder the same thing. I don’t only want skin tight pants that I feel the need to cover up with a long tee shirt in order to walk around the house. I have a teen-aged son who doesn’t want to see his moms fat behind. A little variety is always nice. Something a little more modest is always appreciated. I think a light weight sweatpant is so much more comfortable. And no, a person doesn’t need skin tight clothing to work out. I’ve never seen a guy in a pair of leggings and a crop top. That being said I have probably a dozen pair of leggings, mostly from Fabletics and wonder if anyone has an opinion on the quality of Ellie vs. Fabletics. Ellie looks to be a better deal, but I’m not sure if the quality is there. I have not tried fabletics & my first Ellie box is in the mail still, but I love the Reebok leggings. They are so comfortable, compression so everything stays in place, 100% not see through, lots of cute styles & you can get them for about $18 through Dicks Sporting Goods when they are on sale. I am hoping Ellie measures up so I can start getting these cute outfits. Right with the leggings? I have a love-hate relationship with them. They are infinitely cooler than I’ll ever be…but black leggings are so handy to have. They do definitely look shinier just sitting in a drawer compared to wearing. I just don’t know about them yet….they look good on you though! Hi! I loved this box – you mentioned it was still available for purchase but I couldn’t find anything about it on the website – do you have any idea where past boxes might be located? Thanks so much! 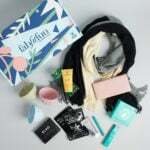 December box is not available but you can buy separate pieces there. I take it back, try their shop and you can get outfit only. It’s one of the choices for January so you would just order it for the current month.